You get two Emotional Support Animal ID cards with your order, one for your companion and one for you to carry in your wallet so you can easily show others what the law says. These cards make it easy to educate the uninformed of your rights. 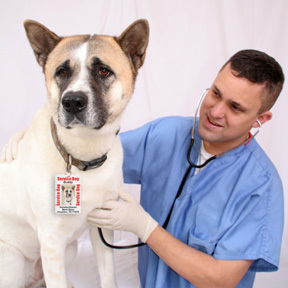 Your Emotional Support Animal ID Tags clearly identify your companion as a Emotional Support Animal with his or her picture on the tag. I received my tags very quickly. These tags are very easily seen and help the airport process go much smoother. The tag is noticable for persons needing to see if she is a service dog. I did get the tags for a large dog though. Thank you for the cute picture. The badge is beautiful and of very high quality. I was impressed with the speedy delivery after ordering (2 business days). I love that it is made in America by a family-owned company. I have shared this site with service dog community friends and will definitely fulfill future needs for my service dog tags here. Thanks for the terrific service. The tag was made promptly and delivered early. It gave me great pride to buy from a family run business and an American made product. Next time I'm going for the deluxe options on the tag. Great Job guys. Idid not realize how much add'l stress I was under constantly explaining the "dog By my side". The highly visable tag has helped to relieve me of that burden. I am trying to move and everyone has the no pets policy . They don't realize, without my dog I have no reason to go on. Click the button below to add the Emotional Support Animal Tag Set for Large Animals (2 Lrg Tags) to your wish list.